Last night I invited my brothers for dinner to watch the premiere of the last season of the ABC’s television series Lost. We have been following this show for the past 4 years so we are excited the final season has finally started to give us the answers to all the mysteries and entangled stories that have us so confused. We all have our theories and interpretations and have long discussions about the characters and the hidden meanings behind this and that. Not since I was in college (early 1990’s) and followed Friends and Seinfeld in “Must see TV” on thursday nights in NBC, have I been so excited about a tv series. This must sound silly, but I admit I don’t get to watch a lot of tv between work, parenting and being a wife, daughter and friend. As part of our meal, I made my version of Cheese Fondue. 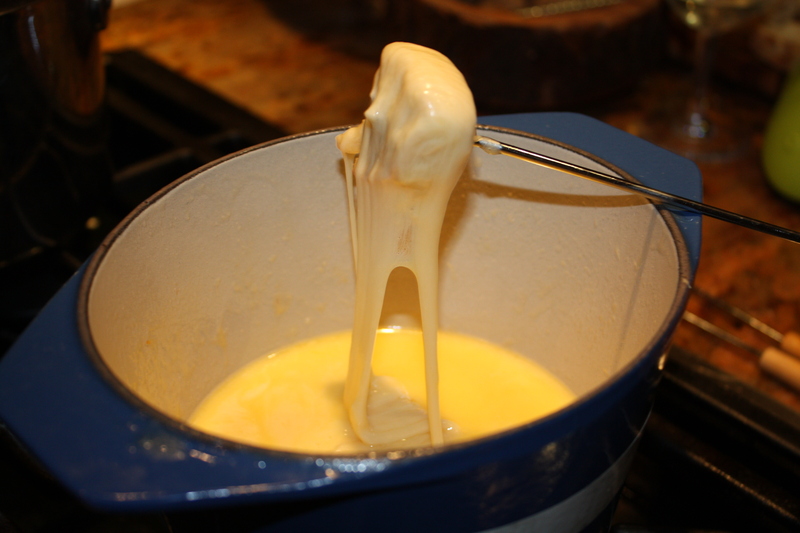 Swiss fondue originated in Switzerland in the 18th century in the canton of Neuchatel. The word fondue has its roots in the french word “fondre” (to melt) and its past participle “fondu” (melted). 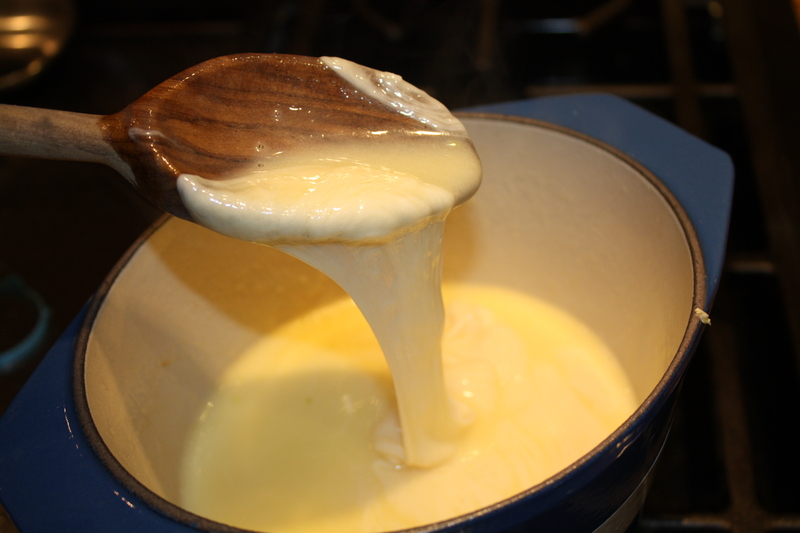 The traditional swiss fondue includes rubbing garlic in the botton of the melting pot (“caquelon”), and melting Gruyére (hard cheese) and Emmenthal (semisoft cheese) with white wine and Kirsh (cherry liqueur). Some recipes suggest adding cornstarch or flour to help incorporate the ingredients to become a semi-liquid substance. Temperature is key because you don’t want it to be too hot that it burns or coagulates the cheese or too low that the cheese mixture becomes hard. When Emilio and I got married, we got a fondue melting pot from Le Creuset as a present. It took me several years to take it out of the box and use it. Yes, I was afraid of it! Now its one of my favorite things to use in the kitchen. Its fun and easy for a small group of guests (maybe you can make it for the Superbowl!) but not for large parties. Make your fondue in your gas stove top if you have one (simmer) and have your guests gather in the kitchen or use a gel alcohol burner under the frame to put it at the dinner table. I don’t particularly like using tealights because its harder to control heat. I use Cointreau instead of Kirsh. Cognac will also do the trick. I mince the garlic and leave it in the mixture instead of just rubbing the sides of the pot. Last but not least, don’t forget about eating “la religieuse” (the nun) or the thin crust of toasted cheese left at the bottom of the pot. Delicious! Bon appetit! 1. 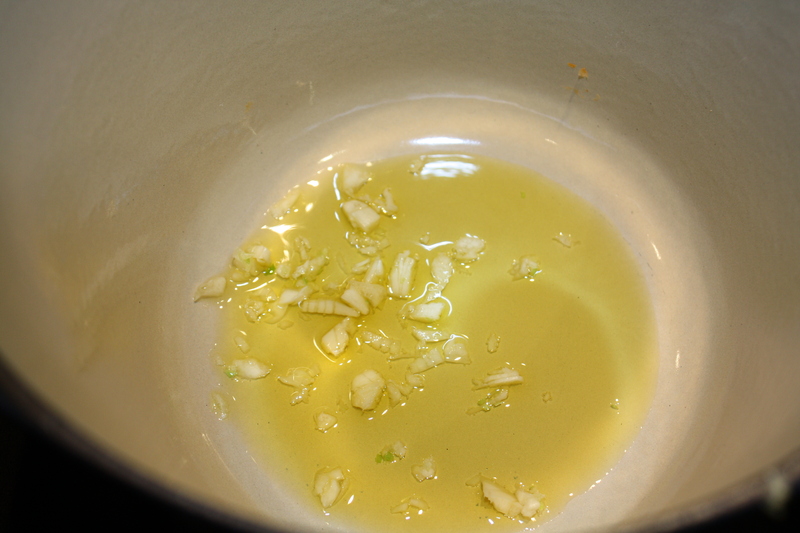 Put extra virgin olive oil and minced garlic in pot and allow to simmer a few minutes. Do not burn garlic. 3. Have crusty bread cut in cubes and skewers or forks ready for dipping. Note: I also make a version of muenster cheese and white cheddar which my kids adore. Just substitute the gruyére and comte with these cheeses and follow the same directions. The possibilities are endless. You may also use Vacherin and Sbrinz as alternative cheeses.